Επαγγελματικό Electronic ViewFinder με οθόνη 3,5″ υψηλών προδιαγραφών. Διαθέτει hdmi είσοδο και έξοδο, με Max Resolution: 1920 χ 1440. Επίσης, είναι αυτόνομο και λειτουργεί με μπαταρία. Ακολουθούν και real φωτογραφίες. Category: Monitors - ViewFinders. Tag: ViewFinders. Feelworld 3.5 Inch EVF Electronic ViewFinder Supports BMPCC for Camera F8 Focus Assist enhances edge sharpening making in focus objects stand out;This makes critical focus immediately easier to see.Brightness, Contrast ratio, Tint, Saturation and color temperature are adjustable;Image 16:9 or 4:3 display switch mode.Multiple position installation ways: convenient combine with tripod with 1/4″ port, magic arm, installed in your best visual position. Almost all the SLR cameras camcorders,like Canon Nikon Pentax Olympus Samsung Panasonic JVC and so on. Adjustable sunshade eyepatch; Screen Marker(80%, 85%, 90%, 93%, 96%). Adopt 5D2 or 550D, use MODE to select HDMI menu first, after picture displayed on the camera, press the camera button, LCD screen flashed before Also comes with Micro HDMI cable to work with BMPCC. Shortcut canon 5D Mark II mode, NO time difference, NO image deformation, NO Black Screen, No Delay, Perfect without distortion. Shortcut button Red, Green, Blue and Monochrome display switch. Earphone stereo output convenient scene pick-up effect monitoring. Shortcut canon 5D Mark II mode. This camera mount adopts qualified metal materials, solid, lightweight and durable. The right angle view machine ( Angle Finder ) is a system accessory dedicated to photograph, can used for turning over to clap the document data, news photograph, providing the image top and bottom the or so all having no the inverse right angle view, combining the Dioptric correction range, convenient customer usage. T7 7inch IPS monitor is of 1920 * 1200 full HD, 450cd/㎡ high brightness, and 1200:1 high contrast. It support 4K HD IN OUT. 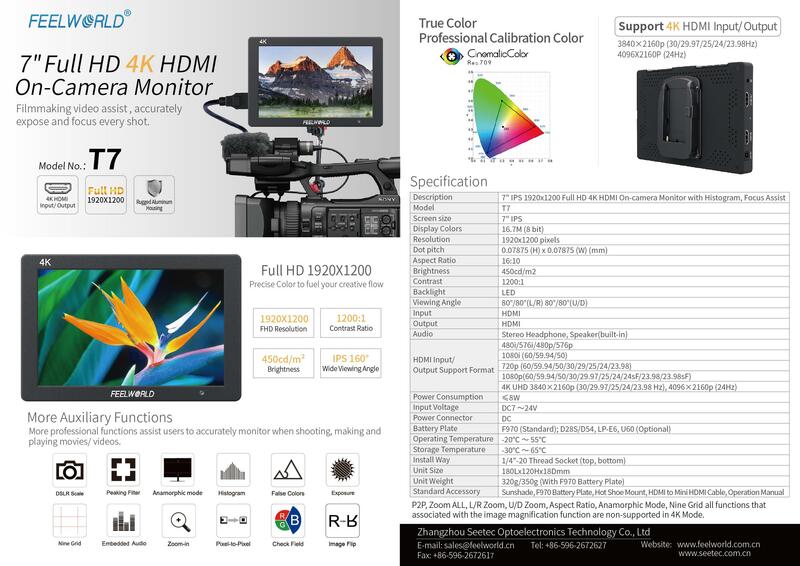 Auxiliary functions including check field, P2P, histogram, false color, anamorphic, focus assist, peaking color, over exposure, embedded audio, nine grid, ratio marker, aspect ratio, zoom, center marker, safe frame, image freeze, image flip and camera mode. Meike View Finder is the missing link of this hybrid “photovideography” era. The essential accessory that enables today’s photographers to take advantage of the video features of the new-generation DSLR cameras.